“Harlekin girl“, 1920s, watercolor on paper. Hans Niehuus remains a mystery. He probably can be seen as author of the aquarelle „Prolet“, former Fishman Collection, signed Hermann Niehaus, too. 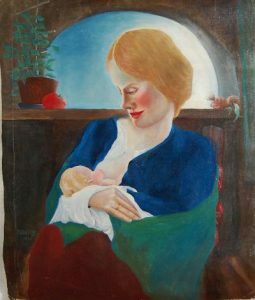 Several other works from the same source as the present „Mother and child“ are documented, signed „Hermann“, „Hans“ and „Niehaus“. Also in the collection: Hans Niehuus, „Mother and child“, 1937, painting on canvas.